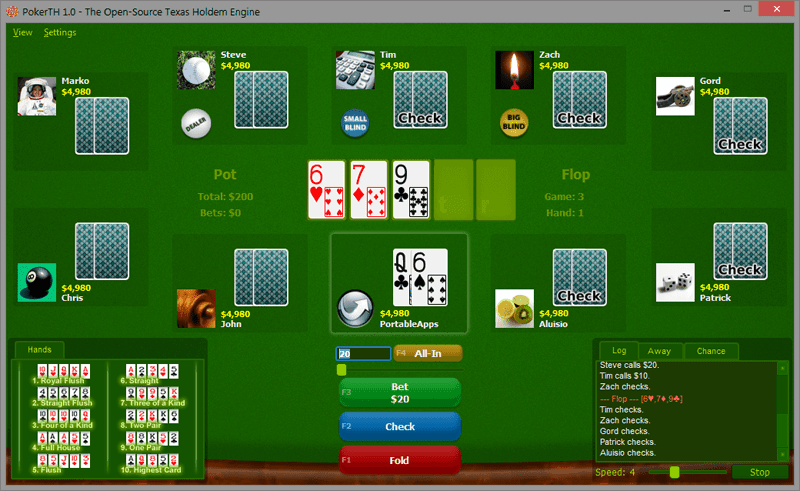 PokerTH is a Texas Holdem style poker game with computer-generated opponents as well as network play capability against opponents all over the world. How to extract: Download the self-extracting EXE to a folder of your choice. Launch PokerTHPortable.exe. http://www.pokerth.net/download.html offers a ZIP package, is the game natively portable? Uno is the PC version of the classical card game, where you play with computer players. You can choose between two to four players, use standard rules or repeat draw etc. How to extract: Download the self-extracting EXE to a folder of your choice. Launch Uno.exe. human is right. looks like the author has been bamboozled by leechers. couldn't the poor guy just upload the files to something like rapidshare? Ammendment to prior comment; Mobius's bug is fixed UNO 1.6 at this address. Patience is a massive Solitaire gaming suite. With over 200 different games, sound effects, dynamic animations, high scores and plenty of customizability, this one is a must-have for any solitaire enthusiast.